When I first heard about Drafts, I thought “What’s the point?” After all, who needs an app in which to draft messages before sending them off to Twitter, or mailing them, or otherwise disseminating them to the world at large? My Twitter and mail apps take care of that already. And then I used it, and it has turned into possibly the handiest little note-taking app I have on my iPod Touch. Drafts comes from Greg Pierce of Agile Tortoise, who is also behind the excellent Phraseology and Terminology apps for the iPad. It is as single-minded and easy to use as these other apps, but manages to pack in quite a few features without getting complicated. It works like this. You start the app and you are launched into a blank note with the keyboard already showing. If you like, you can just type a note and exit the app. You’re done. Next time you launch, you’ll see another blank note — your previous scrawlings have been saved for you, automatically. It actually makes SimpleNote looks complex. If you want to do more, it’s all right there. You can tweet the note immediately using the system-wide Twitter support of iOS5 (there are character and word counts displayed under your note). Or you can mail the note from within the app, send the text to any of the Twitter clients you have on your iPhone, or just copy the text to the clipboard for use elsewhere. 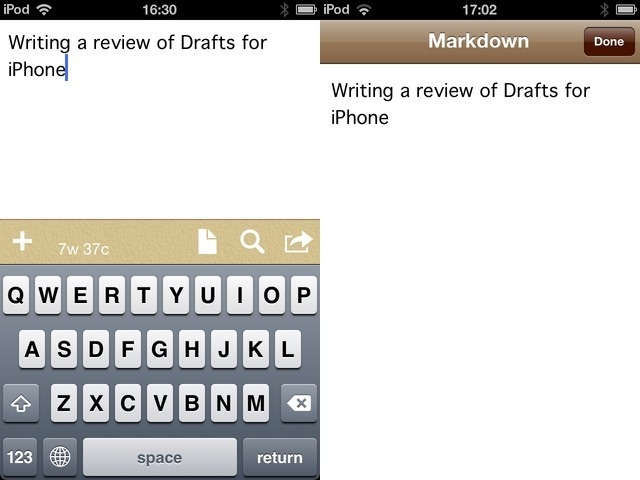 And you can even work in Markdown, and see a Markdown preview before you send or copy the Markdown source. There’s more: Tapping the little sheet-of-paper icon takes you to a list of your notes, and these can be browsed or searched in-line (just like iTunes or Notational Velocity on the Mac). But its the simplicity of getting text into the app that is its strength, and might earn it a place in your iPhone’s dock. The app even orients itself correctly if you open it with the iPhone upside-down, which is something that only iPad apps usually do. Sure, you can customize the color scheme, typeface and text size, but this is really about getting in and out fast. There are a few things missing, but these could all be added in future updates. There’s no iPad version, for one, which forces you to use it pixel-doubled and with the iPhone’s cramped keyboard (although voice dictating the notes works just fine). Also, there’s no sync option. It is easy to get notes out (that’s the whole point after all), but if it would do something as simple as sync with a Dropbox folder then you could share notes with any number of desktop apps. But those really are minor worries. Drafts has already become my default place to stash a quick note, in the same way that Instagram is my default place to stash a new photo. What’s more, it costs just $1. What are you waiting for? Pros: Incredibly slick and easy to use. Customizable. Supports Textexpander. Like the space pen, it works upside-down! Buy it, and never forget anything ever again. Cons: iPhone-only. No syncing options.